I'm adding a wing to my 69 Charger custom. It'd take too long to explain "custom" but suffice to say it's pretty wild. Heck maybe I'll attach a picture. 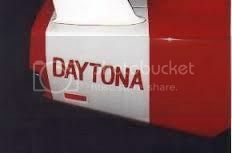 What I'm after is if anyone knows the font (or a modern equivalent) of the letters that spell out "Daytona". I ask because I'm going to spell out something else in the same spot but I'd like it to be sized and styled as close as I can to correct. What I'm after is if anyone knows the font (or a modern equivalent) of the letters that spell out "Daytona"
And about how tall are the letters?